building temple, originally uploaded by c_p_lew. On my morning walk in Pakse, I passed a temple which is being reconstructed - starting with the front gate and boundary walls. The old temple building, made of wood and falling apart, is in the back of the compound. 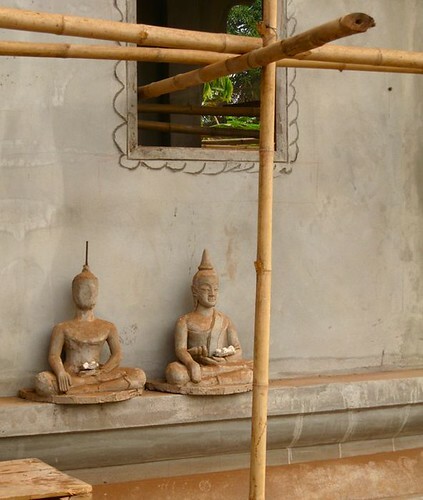 This Buddha images, made of concrete, have a rough beauty to them. The little white balls in their laps are balls of sticky rice, which people have left as offerings. The building behind them is an partially completed shrine.